The study of Richard Flanagan’s novel, The Narrow Road To The Deep North, first published in 2013, allows students to develop an understanding of language, culture and identity. Flanagan’s profound novel ambitiously explores the significance of literature and the ways in which texts, as cultural products, represent ideas as well as past events. The Narrow Road To The Deep North poetically records the experiences of Australian prisoners of war in the Japanese labour camps on the Thai-Burma railway. The central character, Tasmanian surgeon Dorrigo Evans, remembers his affair with Amy, his uncle’s wife. Alongside this love story, the stories of multiple characters are presented which sensitively document this period of Australia’s history, whilst also examining the nature of memory. The novel is based on the shared experiences of those in the camps and the author’s father, Arch Flanagan, to whom the book is dedicated, and the text presents opportunities for students to consider the tensions between documenting past events and crafting fiction. Begin with a discussion of the title, introducing the direct reference to the title of Japanese poet Matsuo Basho’s haibun, written in 1694. Basho’s text combines haiku poetry and prose to record fleeting moments and journeys. The title of Basho’s text has also been translated as Narrow Road to the Interior. What prior knowledge do students have of the haibun: a text which combines haiku with prose, often to describe a journey. Students are to explore haiku and haibun through the following activities. The first line contains five syllables, the second line seven syllables and the final line contains five syllables. To familiarise students with the form, direct them to examine the haikus which begin the sections of the novel. They can also read examples of Basho’s writing online. Students are asked to make a list of natural elements that they might use as the basis of their haikus, remembering that haikus attempt to capture fleeting moments. As with all poetry, word choices are crucial. In haiku, these word choices must also adhere to the patterned syllable structure. If the meaning is clear at the end of the three lines, the rules of syntax do not have to be maintained. Experiment with word order and syntax. Students are asked to attempt to write their own haibun. Begin by asking them to make a list of journeys they have taken. These can be everyday journeys, such as travel to or from school, a walk along a familiar route, or a moment from a memorable holiday. They must aim to write at least three paragraphs (the beginning of the journey, the middle and the arrival at the destination). Once they have a draft of these three paragraphs, they are instructed to write at least three haikus that will be used to separate these paragraphs. These haikus might capture specific moments on the journey or be used to change the mood or tone. Consider, for example, using the usual route home from school as the journey. If students were writing about travelling home at the end of a particularly long and hot summer’s day, a haiku could be used to describe the relief of a cool change, a sudden thunderstorm, or the shade provided by a tree. The novel documents the stories of Australian prisoners of war on the Thai-Burma railway. Introduce this period to students, and establish prior knowledge. This discussion would begin an examination of Australia’s military history and the defining legends of Australian soldiers. This experience of war differs from the myth of the Anzac digger. Establish prior knowledge and discuss the representations of Australia which draw upon the nation’s involvement in world conflict. To begin to understand the historical context and setting for the novel students watch and respond to accounts of Australian prisoners of war including Ray Parkin and Tom Uren, both of whom were friends and co-prisoners of the author’s father, and also research the role played by Sir Edward (Weary) Dunlop, the character who strongly resembles Flanagan’s Dorrigo Evans. As students watch and listen to the accounts of the Australian prisoners of war, they are directed to record details and consider how listening to and reading about these stories informs their personal understandings of hope, heroism, mateship and survival. Introduce to students the tensions which develop when a work of fiction draws on real events from the past. For example in Narrow Road to the Deep North many of the characters are composites or representations of real people who were prisoners on the Railway: Dorrigo Evans is the most obvious, but there are others such as Rabbit Hendricks, Darky Gardiner and more. How does the author balance his literary goals with actual events and real individuals? Students read Ramona Koval’s notes and watch the interview. From this interview what do you learn about the author’s personal context, including his family history and the influence that his father’s experiences had on the development of the novel? Identify how, in your opinion, Flanagan’s own experiences informed the creation of the text. How do Flanagan’s insights about the actions of the Japanese guards and the violence at this point of Japanese cultural history support or challenge your own attitudes? Students may also be directed to the The Line: A Story of the Burma Railway by Arch and Martin Flanagan (Richard’s father and brother), One Day Hill Pty Ltd, 2005, in which Arch writes of his experiences and Martin strives to understand through talking with his father and his contemporaries including: Tom Uren, Ray Parkin and the legendary “Weary” Dunlop. It’s significant that Martin uses Tennyson’s “Ulysses” as one way of understanding Dunlop, just as Richard uses the same poem for Dorrigo. Jo Flanagan, Martin and Richard’s sister, commences the Foreword to The Line with the statement, “My brother is right. We are children of the line.” Richard dedicates his work to prisoner san byaku san ju go (number 335), his father. What do the work and words of the children indicate about their understandings and relationships with their father – his memories and theirs? Record the names of characters they find memorable. Outline why they connect with these characters. Note which ideas or themes they they identify in their first reading. Identify the compositional features: structure, perspective, the use of descriptive detail, and consider how these literary techniques contribute to the exploration of ideas. Reflect on their reading experience on completion of the text. The novel documents experiences of characters involved in the Thai-Burma railway (the Line): the Australian prisoners of war, the Japanese guards, the women who were partners or lovers of these men and their children. The events are not told in a linear way, but explore the nature of memory – an interweaving of events and characters. Central to the plot is the affair between Dorrigo Evans, an Australian army surgeon, and Amy Mulvaney, who is the wife of his uncle. While brief, this relationship haunts Evans. Written in limited third person, the persepctive shifts between a range of characters and tells of the horrific experiences of Australian prisoners of war in descriptive detail. Students create their own comprehension quiz, which will demonstrate their understanding of the narrative elements, character details and the events of the novel. Students are asked to write two questions about any significant aspect, character or event of the novel. When every student has entered/submitted at least one question, the quiz is taken. If using the laptop to record the questions, the teacher may wish to print and copy the questions, asking students to complete the quiz individually OR divide students into teams and have them discuss answers. The purpose of this activity is to establish the level of student understanding from their initial readings. For the following group work activities, the teacher may choose to assign students to groups or allow students to arrange themselves into groups. This would depend on the cohort and the point in the lesson or the stage of the course. The teacher may choose to allocate students to groups or attempt to mix up student friendship groups using strategies such as asking students to form a line according to their birth date, with the 1st of January being one side of the classroom and the 31st of December the opposite wall. The members of the groups determine who will act as spokespeople for the group, who will record their discussion notes and who will monitor how much time is spent on the focus questions. These roles will be recorded. Details on the character allocated will be recorded in a word document under subheadings. From your memory, record impressions of the character you have been allocated. Find details from your reading notes to support your initial impressions. Refer to the sections of texts that you have been allocated. (In table below – for characters marked with *) How does this section reinforce or challenge the representation of the character you had established? As groups report back to the class, begin questioning on themes/ideas. Ask students about the names of the prisoner characters. Are these characters “typical Australians”? Why or why not? The word documents containing notes from this discussion could be collected, collated and shared among students, to inform their reflective response essays. Examining the features of the novel and the ways in which Flanagan has used these elements to express ideas requires students to have prior knowledge of these literary techniques. Close reading of sections of the text will highlight the ways in which these techniques such as characterisation, structure, descriptive language, repetition, sustained images and intertextual references have been used to communicate ideas. What are the strengths and weaknesses of the character? What are their good and bad qualities? Once each group has examined the sections, recording details about the character they have been assigned, the group who focused on Dorrigo Evans joins with the group who examined the character of Tenji Nakamura: the group who focused on Amy Mulvaney joins with the group who recorded details on Ella Lansbury. They present the details on these characters side by side, drawing comparisons between them. The purpose of this activity is to focus on Flanagan’s use of the literary device of character foils. This would also allow for a discussion of good and evil, what it means to be a good man or woman as well as students’ attitudes to whether people can possibly redeem themselves. The non-linear narrative structure reinforces the exploration of the themes of the nature of memory, remembering and forgetting. The novel is divided into five sections, with a haiku at the beginning of each section. The narrative shifts in perspective, as well as in time periods, with events prior to the war juxtaposed with those which occurred after the war. It circles around a single event, the fatal beating of Darky Gardiner, an Australian prisoner. This event is told from various characters points of view and historical perspectives. Students locate these various versions of this event and examine the similarities and differences. Students are asked to consider why this event is retold? Students are asked to undertake close reading of p. 29, where Shisui’s cirlce poem is depicted, rolling “through Dorrigo Evan’s subconscious, a contained void, an endless mystery, lengthless breadth, the great wheel, eternal return: the circle – the antithesis of the line.” This section of text could be compared to pp. 314-316 from, “And what of the Line?” to “Of imperial dream and dead man, all that remained was long grass.” This close reading and comparison would facilitate a discussion of the connections between the text creator’s choice of compositional features, in this instance, structure, and expression of ideas, “people kept on longing for meaning and hope, but the annals of the past are a muddy story of chaos only.” (p. 316). Identify instances where experiences of love and war have been juxtaposed and reflect upon the impact this has on reading experiences. Brainstorm the different ways the text could have been structured and the perspectives from which the stories could have been told. Flanagan recounts a version of the novel that he wrote in the first person plural (we). Why might he have attempted to write using this perspective? Consider how this perspective would change the voice of the text. What if the novel had been written in chronological order, documenting Dorrigo Evans experiences from the first person perspective? The novel draws on poetic techniques. As well as the use of haiku to divide the sections, the repetition of words, the use of rhythm and the use of sustained images are all literary techniques commonly used in poetry, but which Flanagan has employed in his prose writing. The evoking of poetic techniques reinforces the introductory quote from Paul Celan at the beginning of the novel “Mother, they write poems.” These poetic techniques include repeated word choices, rhythm, pace and sustained images. Students are to read the section pp. 246-247 beginning, “Amidst the slurry of mud…” to “The voice was slightly shrill, the voice of a boy, lost somewhere in the body of a dying old man.” Annotate repeated words and ideas. Comment on the impact of repeating words. Ask students to select short sections of the novel that they read aloud. When reading aloud, ask students to experiment with pace, volume and emphasis. How does the pace and the rhythm of Flanagan’s prose help to express ideas, such as ideas of endurance, heroism and hope? The line and the circle. Which of the novel’s central ideas are represented through the use of these sustained images? Students are asked to examine the cover art for the various editions of the text (search for cover designs in Google images). What images are repeated? Which images might they suggest? Allow students to design their own covers for the novel, identifying and justifying their choice of images, as well as the ideas these images represent. Flanagan’s style is readily identifiable by his use of rich, descriptive detail. Memorable sections draw on evoking a range of senses: sight, hearing, smell, touch and taste. In this novel, description can be identified as working in a similar way to the purpose of haiku poetry, to capture fleeting moments. Students are to undertake a close reading of pp. 102-111. Using different coloured pens, they highlight the different senses: sight, hearing, smell, touch and taste. The same close reading is carried out on pp. 49-51. Students then compare the sensory descriptions as well as tone and pace. Have students sit, listen and write down the noises they hear. If possible, take them outside the classroom. When sharing the sounds that they noted, ask them to consider how including a reference to particular sounds might influence the mood and tone of a piece of writing. Consider the hum of a ducted heating/cooling system compared to the single, repeated notes of bird calls. Brainstorm verbs, adverbs and adjectives that they might otherwise use to describe other activities, for example, words that might be traditionally associated with cooking, and direct students to experiment by using these words to describe the tone and rhythm of a range of instrumental pieces which they listen to and then discuss. Students might also add the scene that the music suggested to them. Prepare a snack platter (after establishing that there are no allergies). Have students bite and write, recording words to describe both flavour and texture as well as the associations that they have with what they are tasting. In brown paper bags, conceal objects which have interesting textures (a piece of satin fabric, a polished stone, a sponge, sandpaper). Instruct the students to record words for the feel of the objects. They do not need to identify what they are feeling, rather how it feels. Ask students to experiment with the adjectives they are using, and challenge them to consider using the words they might have used to describe how an object felt to describe a sound, taste or smell. The notes that students make will be returned to when they are asked to complete an imaginative response to the novel. Flanagan’s text can be classified as a work of historical fiction. He has drawn on the experiences of his father and other Australian prisoners of war on the Thai-Burma railway but created fictional characters and situations. Once students have recorded their own memories, they select one to share with another student in the class. The student who is listening to the memory is instructed to take notes and ask questions, as they will then use the memory of another as the basis of an imaginative response which includes sensory description. Students are asked to write and share their imaginative responses, based on the experiences told to them by another student. Students are to consider changing names, developing central characters who differ from their classmates. This activity would also form the basis of discussion about the genre of the novel and the difficulty of Flanagan’s project – accurately recording the experiences of his father and his father’s friends, while creating a work of fiction. Students are asked to consider the responsibilities of writers who undertake these types of projects, considering the purpose of documenting past events in works of fiction. Students would have the opportunity to reflect on their own experiences of sharing a memory that became the basis of someone else’s imaginative piece. The novel explores in detail the significance of literature, how words are used to document real experiences and the central role that texts play in defining cultures and individuals. There are numbers of intertextual references in the novel, including the poem Ulysses by Alfred Lord Tennyson. An exploration of this poem would highlight some of the novel’s themes and deepen students’ understanding of these ideas. Tennyson’s poem expresses the idea that one’s experiences, one’s past shapes one’s present identity. Part of the poem is addressed to his friends, and he urges them to perceive this shared identity and experience. Throughout Narrow Road to the Deep North Flanagan draws upon a very broad range of literary influences, styles and individual works to capture the ambitiously broad sweep of human experience portrayed in the work. It endorses Paul Celan’s use of literature as being of central significance in recording and reflecting events of cultural identity. Allusions abound including: the opening line of chapter two, “A happy man has no past, while an unhappy man has nothing else.” (p. 3) which draws upon Tolstoy’s notion of family, either characterised by their conformity in happiness, or by dysfunction in unhappiness. Similarly, in another direct allusion, Dorrigo consciously decides to “charge the windmill” just as in Cervantes’ Don Quixote. In an interview with Ramona Koval for the The Monthly Flanagan retells his parents’ story of the Latvian emigrant to Longford (Flanagan’s Tasmanian birthplace) who had searched for his lost wife in the devastation of post WW2 Europe without success, and then twelve years after the war, seeing her with her own children in a Sydney street and then having to make the split second decision to approach her or not and thus change the course of both of their lives. This poignant story, on which the author notes the whole love story of the novel is based, is partially reflected in the 1940 wartime film, Waterloo Bridge, in which Robert Taylor and Vivien Leigh meet on the bridge and fall in love. With some direction, students could seek out likely or possible intertextual and intergenerational references such as those listed above and explore the original sources and contexts, noting how they might apply to Flanagan’s characters and themes. The Narrow Road to the Deep North is open to critical responses which interrogate Flanagan’s representations of race and gender. The novel begins with Dorrigo Evans’ earliest memories of: “sun flooding a church hall in which he sat with his mother and grandmother. … Women who loved him. Like entering the sea and returning to the beach. Over and over.” (p. 1). Students are to return to earlier discussions on the imagery used in the novel which connects women and the ocean, as well as the character foils of Amy and Ella. Students are then asked to consider how both this system of imagery and charactersation rely upon binary representations of gender, with femininity associated with nature. How might these images as well as the descriptive prose connect ideas of home and comfort with women? Identify where the female characters are cast as either mother, wife or seductress? When do women provide comfort, nurture or temptation? Identify the connections made between women and place/home. How might these images support traditional gender expectations? Which aspects of Australian national identity shape gender, particularly masculinity? What are the sites of gender formation for Australian men? (Sport? War?) In what ways might the POW characters challenge the legend of soldiers as part of Australia’s national identity? The smell of the eucalypt bark, the bold, blue light of the Tasmanian midday, so sharp he had to squint hard to stop it slicing his eyes, the heat of the sun of his taut skin, the hard, short shadows of the others, the sense of standing on a threshold, of joyfully entering a new universe while your old still remained knowable and holdable and not yet lost – all these things he was aware of, as he was of the hot dust, the sweat of the other boys, the laughter, the strange pure joy of being with others. Kick it! He heard someone yell. Kick the fucker before the bell rings and it’s all over. Students are asked to consider the images used in this section, to explore ideas of heroism, of sport as a quest and the ways in which sporting achievements can define masculinity in Australia. How are the values of physical endurance and stoicism valued in Flanagan’s representations of the POWs? The novel relies upon representations of nationalities, the Australian soldiers and the Japanese guards. Reading with a postcolonial lens, it seems Flanagan has attempted to address the “otherness” of the characters of the guards, partly by posing moral questions regardless of nationality. Students are asked to consider the connections made between cultural groups, beginning with the epigraph, the line from the poet Paul Celan “Mother, they write poems.” Why do students think that Flanagan has used this line to frame the ideas explored in the novel? How does the epigraph establish a particular representation of race? Students could be directed to read and respond to the review from the Japan Times. As already noted an enduring theme in The Narrow Road to the Deep North is the notion of memory – of remembering and forgetting – and the power of language in recording events of cultural significance. As a work of historical fiction it explores how memories change both with time and perspective. To explore this concept of what is memory and what is history, both individual and collective, national and international, students could be asked to consider Flanagan’s novel alongside a range of other works, including Australian historical fiction such as Kate Grenville’s The Secret River, Christopher Koch’s Out of Ireland, Peter Carey’s The True History of the Kelly Gang or Kim Scott’s That Deadman Dance (these latter two novels also have Reading Australia teaching units available on this site) or to works which merge fact and fictional interpretation more directly such as Tom Keneally’s Schindler’s Ark and more populist works such as James Clavell’s King Rat. The film The Railway Man (2013) directed by Jonathan Teplitzley, represents the experiences of Eric Lomax, a British prisoner of war on the Thai-Burma railway. Viewing this film would provide students with clear visual images of the landscape, the conditions in the jungle, on the Line and in the prison camps. The ideas explored in the film: love, war, courage, survival, forgiveness and friendship parallel the ideas expressed in Flanagan’s novel. NB While students will have read detailed descriptions of torture, trauma and suffering in The Narrow Road to the Deep North, it would be important to caution students of the graphic nature of some scenes in this film prior to viewing. Students may consider other texts which document experiences of war and the impact of war on those who survive it. Texts such as Billy Lynn’s Long Halftime Walk written by Ben Fountain, Catch 22 by Joseph Heller and Heart of Darkness by Joseph Conrad, alongside the film Apocalypse Now directed by Francis Ford Coppola, explore a range of representations of soldiers and their experiences. The film Gallipoli directed by Peter Weir could support the discussion of the significance of the Anzac in defining versions of Australian spirit and Australian masculinity. In understanding shared and collective memory, students will inevitably be drawn into a range of historical contexts and will ask questions such as, “What actually did happen there?” In the Initial response section of this unit, Arch and Martin Flanagan’s joint work, The Line, was cited as a reflection in which father shared with son and the son strove to understand that experience and the man himself, not just from his father’s experience, but also from that of his co-prisoners: men such as Tom Uren, Weary Dunlop, Ray Parkin and others. Students can be directed to the Australian War Memorial site which not only details the history of the Thai-Burma railway, but also provides extensive detail on many of the individuals involved, many of whom went on to play a significant role in developing and shaping Australian society. If time allows, students might also like to look at history as a social construct, investigating the panorama of texts which stretches from works of fiction (set in an historical context) through to works of scholarly historical importance with a bewildering variety of in-between adaptations. In an Australian context such texts might include everything from Christopher Koch’s Lost Voices and Richard Flanagan’s Wanting, through the range of popular historical retellings by raconteurs such as Peter Fitzsimons and David Hill, to serious biographical and historical work such as Jones Town by Chris Masters and The Fatal Shore by Robert Hughes, and the works of eminent Australian historians such as Lyndall Ryan, Geoffrey Blainey and Henry Reynolds, amongst many others, both past and contemporary. On another level, one often sees at the start of films the introductory, “This story is based on actual events,” or similar words sometimes with a variety of disclaimers such as “some characters/names/events have been altered for dramatic effect etc. etc,” but what does this mean and how fictionalised has the story become in the interests of the drama or narrative purpose of the text itself? Students might like to consider in class or group discussion what purpose is intended by directors, screen writers or producers by including such statements. Again on an everyday populist level, these issues and tensions could be further investigated by considering other large clutches of purely fictional “historical work”. These are most popular as television series, films or published fiction, often in series or film franchise form. Generally labelled period dramas, in which the setting is from some time in the past, these works can create great public appeal. Students might like to look at some of these dramas and put forward their thoughts, either in written form or as part of a class or group discussion, as to why they are so popular. Students have the option to draft and refine the haibun they began OR craft and develop the piece they wrote based on the memory of another student in the Initial response section of this unit. When submitting their imaginative piece for final assessment, students are also required to complete a reflective statement of around 500 words in which they identify and justify their use of literary techniques, connecting their choices to those made by Flanagan. When completing a sustained critical response to the text (somewhere in the vicinity of 1,500 words), students would be encouraged to write their own focus question, which allows them to: closely examine a selection of the text’s themes, detail the ways in which these ideas have been expressed, and reflect on their own their own reading responses. If students write their own focus questions, and include the first person in this question, they are more likely to produce genuine responses. 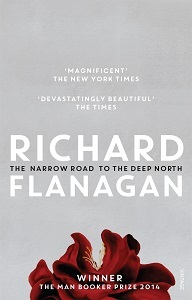 In the novel The Narrow Road to the Deep North, Richard Flanagan represents historical events. How have these representations challenged and supported my understanding of heroism and national spirit? The novel The Narrow Road to the Deep North focuses on the experiences of Australian prisoners of war. How have the stories of these characters informed my understanding of Australian masculinity and the ideal of ‘mateship’? The Narrow Road to the Deep North explores ideas of remembering and forgetting. How has reading this novel challenged my understanding of “Lest we forget”? How does reading The Narrow Road to the Deep North support my understanding of the role of literature in recording events of personal and cultural significance? The Decline of Love and the Rise of Non-Freedom – Text of Flanagan’s essay and Alan Missen Oration. London Review of Books – Is his name Alwyn? Duration Five weeks (minimum). The unit assumes that students will read the novel independently. A number of the initial activities do not require students to have completed the novel and could be undertaken while students read the text as homework. ELLEN REES has taught English for twelve years, teaching mostly at senior secondary level. She is dedicated to finding engaging ways for students to read and respond to texts, allowing students the freedom to draw on their own experiences, expertise and imagination. She teaches English Literature and English Writing at Hobart College.